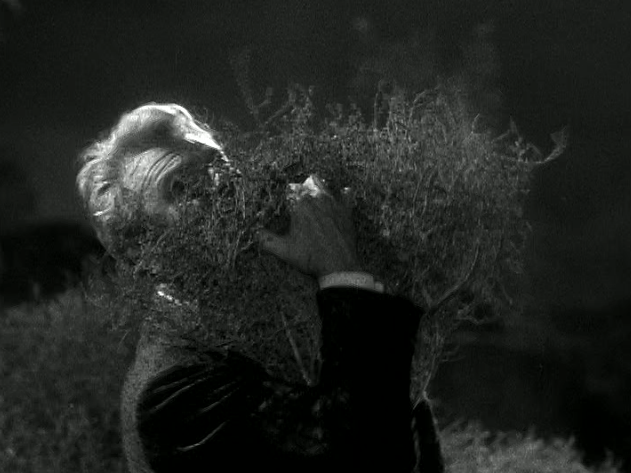 To be honest, I had never gotten past Eddie Albert and wife being attacked by sentient tumbleweeds. What might have been a workable idea in Louis Charbonneau‘s original story looks beyond ridiculous on TV. Tumbleweeds creep up, creep back, hurl themselves at Eddie. At one point he grabs one and smooshes it all over his face as if he’s being attacked. After a struggle, he wins. Did you see that honey? he asks. That thing attacked me! You actually feel bad for Eddie Albert, the actor, at this point. Eddie Albert, who wrote and starred in the first ever teleplay on television way back in 1936. Eddie Albert, hero of Tarawa. Eddie Albert, anti-hero of Attack. And here he is battling a crazed tumbleweed. There are hundreds of the things. Vast hordes of murderous tumbleweeds. We get back to town, Eddie tells his wife, and l’ll give up the idea of living on a farm. That usually did it for me right there. This time I stuck it out but nearly gave up after they were attacked by hundreds of frogs. The scene lacked even the production values of the Ray Milland opus a decade later. Here, someone appeared to be hurling basketfuls of frogs at them. Worse yet, they were apparently living frogs, big bull frogs. You’ve never seen so many bullfrogs. The frogs squirmed, the wife screamed. They retreated back to the farmhouse. Their next foray out almost made it to the car but was driven back by deadly sentient rocks. It looked liked Buster Keaton in the avalanche scene in Seven Chances except Arthur Hunnicutt, playing a farmer named Lamont right out of Green Acres (and whose house they had sought refuge in) is struck and killed. That never happened in a Buster Keaton movie. These are just symbols. l can’t read these. This is not Lamont’s writing. He’s transcribing it into the alien’s language. l was hoping he’d translate the thoughts into his own terms. Write enough symbols so we can establish a pattern. There’ll always be somebody to decode. Now it’s just some meaningless symbols. About four lines of them. There’s not enough of them. There’s no way to learn the key. The muscles move and the joints function, but that’s all. Otherwise, he’s just a zombie. What good can a dead body be to that alien intelligence? Not very much. l don’t think that it really understands. Maybe it can’t conceive of death. What a tragedy. Finally, it gets a human carrier (after tumbleweeds, frogs and rocks) and still it can’t communicate. Thought has no language. We think in pictures and sensations. Then we translate these ideas into our own words and sentences. Now, suppose this thing has a concept and it wants to put it into a living brain…. And that’s what they do. Eddie, much like Mr. Spock would do a few years later with a Horta (ask your nearby Trekkie), mind melded with the alien intelligence, via Lamont’s notepad, though it looked a little more like some kind of Harry Houdini channeling the dead through writing thing. Sure enough, he was right, it was an alien intelligence, trying to make their presence known and ensure their legacy by adding either DNA or RNA (I can’t remember which) to some meteors. It seemed to be only marginally effective. Eddie had figured it out, though, in one of the great scientific discoveries of all time. We really can communicate with vastly different exocivilizations than our own. Sure, the tumbleweed idea was a no go, but that ill defined mind meld thing had worked. Eddie wanted to tell the world the exciting news. But then who would ever believe him? His wife pointed out that they have Lamont’s notebook. That was proof. Surely the world would believe that. No they wouldn’t. The ramblings of a deranged mind, Eddie could hear them them saying, meaningless symbols nobody can decipher. Best to keep this our little secret. They leave the canyon with a sigh and drive back to the city. There’s a moral in there somewhere. thought has no language. We think in pictures and sensations. Then we translate these ideas into our own words and sentences. Because I’ve been writing with that idea in mind for years now. Not that there is no language in thought–there obviously is in much of it, if only because we can hear the inner voice in our skull all the time–but that not all thought is language. Tremendous amounts of human observations and perceptions exist without language at all, and that is what I try to tap into when I write. Not my own, obviously, as I am the one writing, but into the reader’s. It’s this idea of writing to connect with the brain beneath language, directly into sensation, reaction, observation. To describe a room and make the reader feel like they are actually there, and it is not me narrating but them experiencing. Using language to go beyond language. My words as pictures and sensations, as if the writing wasn’t even there. I just never expected to hear the idea uttered by a man who’d just fought off a maniacal tumbleweed. 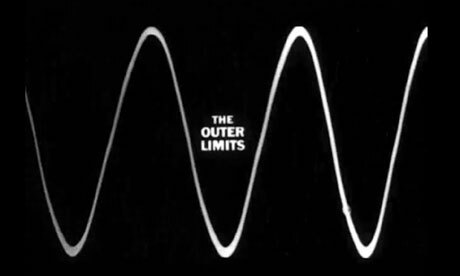 This entry was posted in Television and tagged Arthur Hunnicutt, Eddie Albert, linguistics, Outer Limits, tumbleweeds. Bookmark the permalink.